I am a web designer and wanted to bring my hobbies together. So I created Whybike.com. I have been riding since I graduated from college in 1999, and ride almost every day. If I could afford it I would have a commuter bike, a long range tourer, a boulevard cruiser and a sport bike. Since I do not have that kind of cash I comprimise. 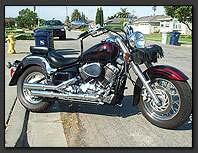 I have a Yamaha V-Star and a Kawasaki ZR-7S. 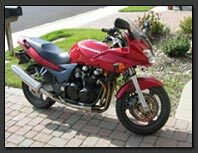 You can read about some of my more interesting rides in the motorcycle blog and see some of those in the videos section. I don�t claim to be the best rider in the world or know all there is to know about motorcycles, but through your help commenting on blog posts, submitting articles, shooting videos and sending us your trip reports we can try to document why we bike, while helping out those just getting into motorcycling.